M’bour, Senegal. 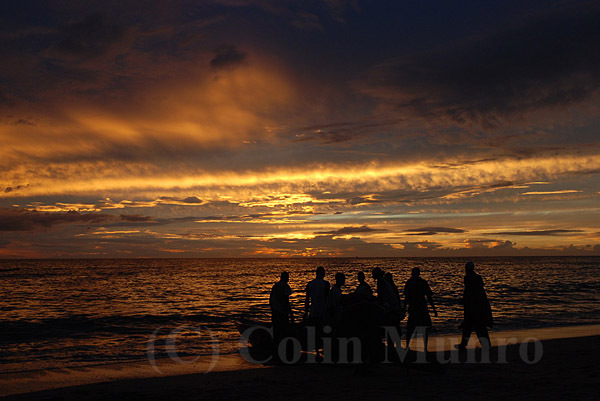 Fishermen haul a small fishing pirogue (wooden canoe) up on to the beach at sunset. Image MBI000739. Please email me, quoting this number if you’d like to license use of this image or purchase a fine art print. 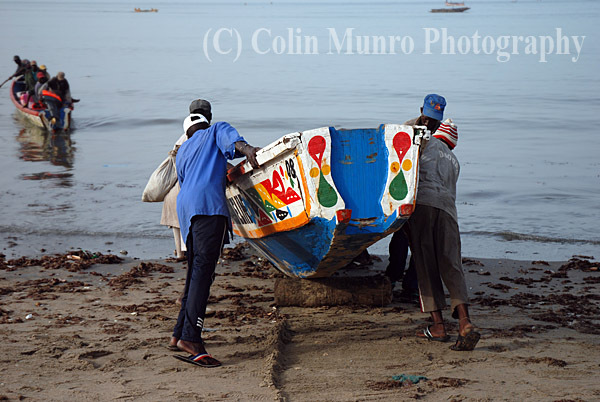 In November 2008 I spent two weeks living in M’bour, a dusty transit stop and fishing port halfway between Dakar and the Gambia. I spent this time getting to know the fishermen, going to sea with them, learning how they worked, the risks they took travelling up to 20 miles offshore in leaky open canoes without so much as a compass to guide them. I learned how they spent days at sea in tiny canoes, sleeping in the bottom of them, risking storms or being swept out to sea. As there canoes have no lights they also run the risk of being mown down by trawlers at night. Many do lose their lives each year, but economic pressures are causing a growing number of young men to turn to fishing. This brings its own problems; the fishery is almost completely unregulated but anecdotal reports suggest this is having a significant impact on stocks of some species. Robust data is hard to come by, given the unregulated nature of this fishery, but the Senegalese Directorate of Marine Fisheries estimated that in 2004 a little over 6000 such canoes were operating along the coast of Senegal. The main species caught are small sardinella (Sardinella aurita and S. maderenis) and horse mackerel (Trachurus trachurus). 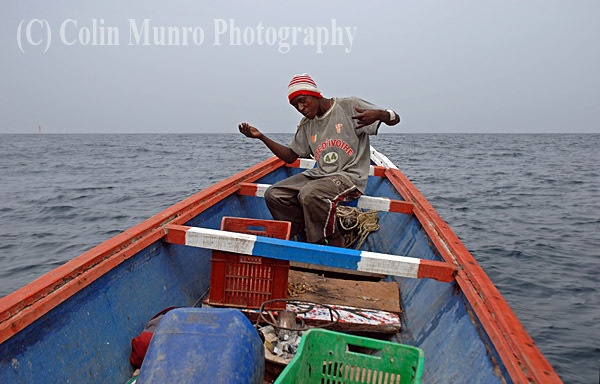 In 2008 the fishery off M’bour and nearby Joal Fadiouth was considered over-exploited (source FAO,Fisheries Circular No. 1033, 2008). 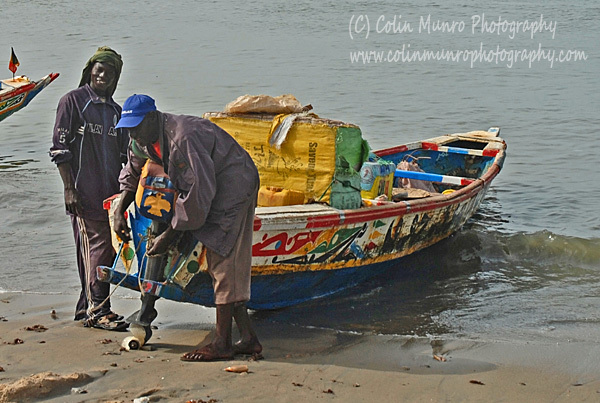 Our fishing canoe, or pirogue, being lanched off beach on wooden rollers, M’bour, Senegal. Image MBI000628. Please email me, quoting this number if you’d like to license use of this image or purchase a fine art print. Now fully laden, our ancient outboard is securely fastened with bailing twine. Note the well balanced ice box perched toward the stern of the canoe. Image MBI000628. Please email me, quoting this number if you’d like to license use of this image. M'bour, Senegal. 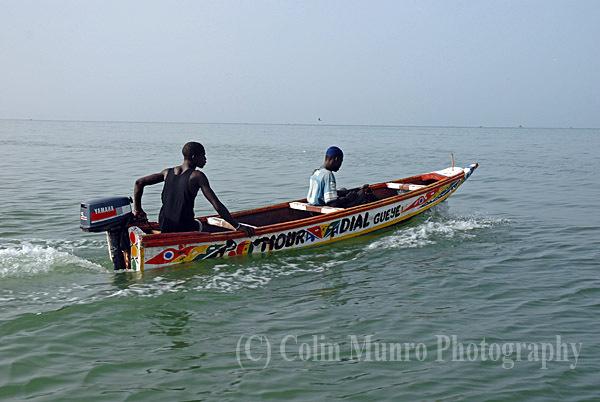 Two Senegalese fishermen head out to sea in a small pirogue (traditional wooden canoe). Image MBI000909. M’bour, Senegal. 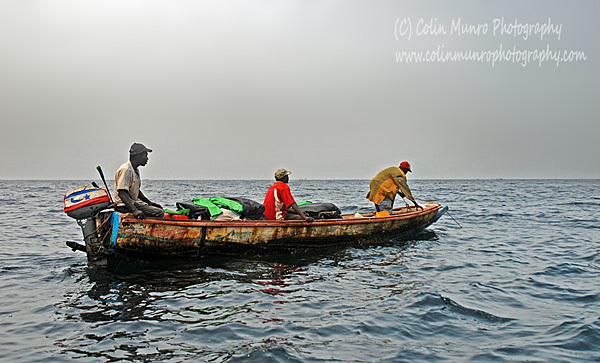 Two Senegalese fishermen head out to sea in a small pirogue (traditional wooden canoe). Image MBI000909. Please email me, quoting this number if you’d like to license use of this image or purchase a fine art print. I spent a day at sea on one of these tiny boats. Simply making it through the surf was quite an acheivement; the boat had no ballast and was so top heavy, due to ourselves and the large box of ice we were carrying, that we appeared in imminet danger of capsizing. Fortunately we shipped quite a lot of water quite quickly during a rather shakey lauching, which stabilised the boat by providing some ballast, albeit not a recommended way of doing so. Powered by an ancient 15hp outboard engine, attached by bailing twine and duck tape, we headed out to sea for about three hours, by which time I estimated we were about fifteen miles offshore. We set off in a grey haze that quite quickly enveloped the land and the sun, leaving motoring on within a completely featureless sea and sky. I watched with growing alarm as the sky changed; growing dark and heavy, and a stiffening breeze spring up. Shortly after this we came upon a similar canoe, drifting aimlessly as their similarly ancient had died. To it’s crews consternation our boat skipper offered not to towed them to port but to a point where they ‘had a better chance of being spotted’ by a home-bound canoe. So for half and hour or so we towed them further out to sea (or at least it seemed so) before leaving them to anchor on what appeared an equally featureless spot of grey sea and sky to the one where we picked them up. We never saw them again so I rather hope this indicated that they had indeed been towed ashore. Our unhappy fishermen drop anchor and start their wait for a passing vessel after we tow them to a ‘better’ location. At one point Pape, the boat’s owner, asked me which direction M’bour lay. With no visual clues to guide me I based my guess on the heading I thought we had set off on. Apparently I was almost 180 degrees out. I asked Pape how he could tell, with no compass or electronic aids; the wind direction he informed me. So, I enquired cautiously, does it always blow from the same direction this time of year? No, he cheerfully informed me, sometimes we get lost. I rather wished I hadn’t asked. Eventually we arrived at the fishing grounds. Hooks were baited with frozen prawns and handlines set. A small stove was fired up in the middle of the canoe and sugary tea the colour and consistency of stockholm tar brewed. A small cup was passed around from which we all took small sips; more than would most likley have resulted in irreversible damage to my intestines. This was supplemented by by joints also passed around. Tea, reefers and small amounts of rice and peanut porridge (gosi) were pretty much all the crew had to survive on apart from whatever they caught. Around two hours passed, in which time we had caught maybe a dozen fish, mostly sardinella, horse mackerel and a few bigeye grunt (Brachydeuterus auritus). Barely enough to feed us at sea, let alone provide a wage for all three fishermen. Around four in the afternoon, by which time the chop on the sea had risen significantly and little whitecaps had started to appear, we finally decided to head back inshore. Much to my relief, Pape’s sense of direction proved accurate. The sun was setting when we finally reached M’bour, and there have been few occasions when I’ve been quite so pleased to step on to dry land. Pape and his crew would probably go to sea again tomorrow, maybe staying out for one or two nights this time. 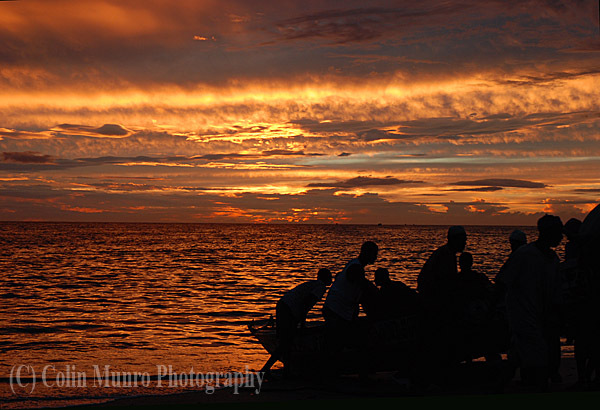 I thought that night of the meagre catch we returned with after a day at sea, of the broken down canoe we had come across and of the stories Pape had told me of getting caught in a storm and drifting helplessly for three days before sighting land. 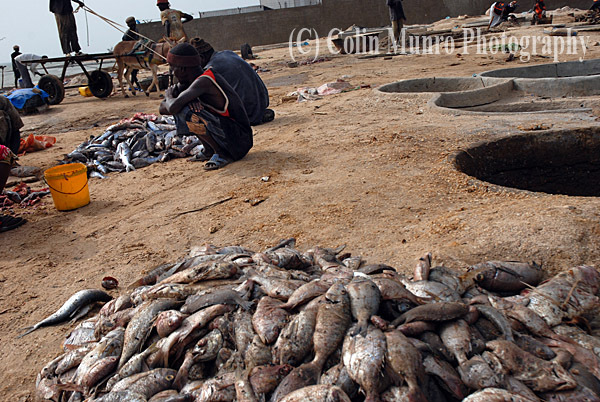 Overfishing is a massive problem on the West coast of Africa. Much of this problem is actually due to poorly regulated fishing by large trawlers from outside Senegal: Russian, Korean, Japanese, Chinese and European boats. It has been estimated that a large trawler will, on one good day, catch as much as fifty pirogues will in a year. Vessels are licensed by the Senegalese Government who argue that if they don’t sell licenses then neighbouring countries will; stocks may still suffer and Senegal will lose vauable revenue (Grégoire Allix, le Monde/Worldcrunch, 2011). What is a matter of concern about the long term effects of overfishing for us in the West can be a question of survival for some on the coast of Senegal. M'bour, Senegal. Fifteen miles offshore a Senegalese fishermen hand lines for fish over a sand bank. Image MBI000908. 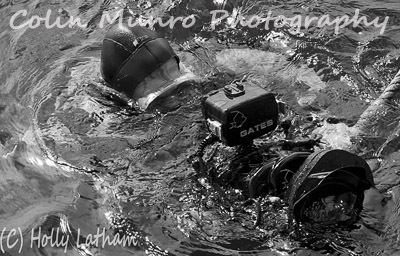 One of our crew handlines, delicately holding the line waiting patiently for a bite. Image MBI000908. Please email me, quoting this number if you’d like to license use of this image or purchase a fine art print. Fish salting pans, M'bour, Senegal. Image MBI000609. Fish salting pans, M’bour, Senegal. Image MBI000609.” title=”MBI000609. Please email me, quoting this number if you’d like to license use of this image or purchase a fine art print. View more of my images of Artisanal Fishermen in Senegal and around the World here at my Photoshelter website.